The purpose of this article is to report general results obtained from a written survey of 81 high tunnel users regarding management practices related to production of horticultural crops in their tunnels. Growers were in Iowa, Kansas, Missouri, and Nebraska, and results were obtained between 2005 and 2007. Fig. 1. 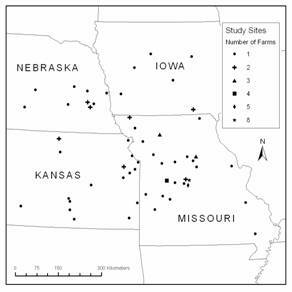 Locations of high tunnel producers surveyed from Iowa, Kansas, Missouri, and Nebraska. Fig. 2. Years of high tunnel crop production experience in 2006, reported by growers in a survey of producers from Iowa, Kansas, Missouri, and Nebraska. Fig. 3. Percent of growers that reported producing various vegetable crops in high tunnels at some time during the years 2002 to 2006. Fig. 4. Portion of producers that reported growing crops in high tunnels during each month of the year. Results of a survey of 81 growers from Iowa, Kansas, Missouri, and Nebraska conducted from 2005-2007. The target population for the questionnaire was growers who had used high tunnels for in-ground crop production for more than two years in Iowa, Kansas, Missouri and Nebraska. Results of eighty-one questionnaires are reported here. States were represented as follows: 54% Missouri, 23% Kansas, 14% Nebraska, and 9% Iowa. Locations of survey participants in these states are indicated on the map (Fig. 1). tunnels was four years at the time growers completed the survey (Fig. 2). (Growers with less than three years of high tunnel experience are under represented in this survey because they were not actively sought.) The largest number of survey respondents constructed an initial high tunnel in 2002. High tunnel design and size varied. The most common high tunnel size was 30 ft by 96 ft (268 m2). Only seven high tunnels were more than 100 ft (30.5 m) in length. One grower had a 400-ft-long tunnel. The most common crop in high tunnels was tomato (Lycopersicon esculentum Mill.). Ninety-one percent of growers surveyed had produced tomatoes in their high tunnel within the past four years. The majority of growers produced several vegetables in their high tunnels. Salad crops like lettuce (Lactuca sativa L.), spinach (Spinacia oleracea L.), other leafy greens, cucumber (Cucumis sativus L.), and pepper (Capsicum sp.) were favored for high tunnel production (Fig. 3). Bean (Phaseolus sp. ), onion (Allium cepa L.), broccoli (Brassica oleracea var. italica Plenck), eggplant (Solanum melongena var. esculentum Nees), squash (Cucurbita sp. ), and melons [Cucumis melo L. and Citrullus lanatus (Thunb.) Matsum & Nakai] were among the medley of crops grown. Other vegetables not represented in Fig. 3 were grown, but by less than 5% of those surveyed. Some growers focused on a single crop. Tomato was the sole crop for 26% of growers surveyed. Three percent of growers produced only salad greens, 1% only flowers, and 1% only strawberries. Thirty-one percent of the growers surveyed produced flowers in their high tunnel. Growers collectively listed 43 flower crops that they had grown. Lisianthus [Eustoma grandiflorum (Raf.) Shinn.] was the most commonly grown flower, reportedly grown by ten of the twenty-five respondents who grew flowers. Delphinium (Delphinium nuttallianum Pritz. ex Walp), dianthus (Dianthus armeria L.), geranium (Pelargonium x domesticum L.H.Bailey), petunia (Petunia hybrida Hort. Vilm.-Andr. ), sweet pea (Lathyrus odoratus L.), zinnia (Zinnia elegans Jacq. ), and tulip (Tulipa sp.) cut flowers were each grown by four growers. Other flowers were grown by fewer than four growers. One of the main advantages of high tunnel use is an extended growing season for crop production. Growers extended their crop season by planting earlier in the spring and some crops extended into the autumn. On average, high tunnels had a crop for nine months of the year. January was the least utilized month with only 33% of high tunnels in use (Fig. 4). Twenty-five percent of growers surveyed grew a crop or cover crop in their high tunnel year round. Many high tunnel growers attempt to combine the benefits of organic and conventional fertilizers. Thirty-five percent of the growers surveyed reported using organic soil amendments exclusively. But overall, some organic soil amendment was used by 85% of growers surveyed. Organic additions were made on an annual basis by 66% of the growers and more frequently by 14%. Multi-element conventional fertilizer was used by 56% of growers surveyed, or 73% of the sixty growers who responded to questions about their use of conventional fertilizers. Table 1. Soil amendment use reported by growers from Iowa, Kansas, Missouri, and Nebraska in a survey conducted from 2005 to 2007. Growers tend to till prior to planting a new crop; therefore, tillage frequency is mostly determined by crop turnover. Forty-seven percent of respondents reported tilling their high tunnel soil once annually, 32% twice annually, and 14% more often than that. Tillage depth was eight inches or less for 82% of growers. Cover crops had been used by 41% of growers. Occasional use of cover crops was reported by 21% of growers. On a regular basis, cover crops were grown in the winter by 13%, in the summer by 2.5%, and in both summer and winter by 5% of growers. Fifty percent of growers practiced some form of crop rotation. Crop rotation systems were described as growing different crops in successive years or rotating crops to different areas of the high tunnel. Survey participants generally expressed the opinion that their success with high tunnel crop production was due to good site selection and regular organic matter additions.